When College Freshman 101 arrived at Feathered Quill, I was excited to see it and grabbed it for my review stack. Back in 2011, I had read the first book in this planned trilogy, Almost a Senior, and found it a very enjoyable read. I was eager to learn what happens to the protagonist, Loresha Evans, as she embarks on her college adventure. We first met Loresha when she was a junior in high school, in Almost a Senior. Loresha, a young woman growing up in Harlem, might have been marked for failure by many, but they didn't know how strong she was, nor how determined she was to get what she wanted. She knew that graduating from high school was necessary to set her on the path to reach her dream of going to college, and so, throughout the first book, we follow Loresha as she struggles, and prevails. Now, in College Freshman 101, we catch up with Loresha once again, this time as she prepares to leave the streets of Harlem for the lush, green grounds of a beautiful college in Massachusetts. Saying good-bye to her family and friends, Loresha makes the several hour trip to her new home, at Jackson College, where everybody seems to fit in except her. The first thing that Loresha notices is that the school is predominantly white. Will Loresha find a place at her new school? Loresha's roommate, Cookie, starts off by annoying her without even trying - 'Loresha' seems too long a name so Cookie calls her 'Lori' and when that doesn't work, 'Whatever' seems to be the new name. Loresha is unhappy to say the least, but when she ventures outside, she spots "Another Black student...maybe I would make it here after all." Loresha soon finds several friends among the small Black and minority population at school. Eager to fit in, she goes along with them as they steal money from the library's copier machines. Loresha is hesitant to go along, but when the others in the group encourage her with lines such as, "We're not stealing. We're on financial aid," she gives in and acts as a decoy while others take the money. While Loresha makes some bad choices, she also makes some decisions that show she is maturing. Anxious to earn some money, she takes on a work-study job recording the life stories of Black people working in the area. And while she does party hard, she also is quite serious about studying. That determination to get good grades is also what leads her to a tutor, Walke Simms, a handsome graduate student. Loresha is immediately drawn to the young man, but is he falling in love too or just using her? Told in the first person by Loresha, I was instantly drawn into College Freshman 101. While I honestly can't relate to the trials that Loresha was going through because our backgrounds are vastly different, the author did such a good job of writing a well-fleshed out main character, that I truly was interested in Loresha's life. When she helped steal the copier money, I found myself cringing, hoping that she would see the mistake she was making. Other characters, too, were well crafted - I particularly liked the way Loresha's relationship with her roommate Cookie changed over time. And while the new college student fell for the hunky graduate student's claims of everlasting love, many readers will undoubtedly scream at Loresha not to fall for his sweet talk. While there were a few spots where the dialogue was a bit strained, overall it was a very satisfying read and I truly enjoyed catching up with Loresha. I look forward to meeting Loresha again in the final book in this enjoyable trilogy. Quill says: New friends, life lessons, heartache and joy await Loresha as she embarks on her first semester of college. It's a journey she won't soon forget, and I suspect that for the reader, the story will also linger long after the last page is read. Book Review - When I Grow Up I Want To Be...A Teacher! It is becoming a difficult thing to find a children’s/pre-teen book that is not only engaging, entertaining and fun, but ALSO teaches us great lessons while educating readers. That’s why, when the series: “When I Grow Up I Want to Be...” first came out, with the first title taking a look at becoming part of the U.S. Army, readers began buzzing about it immediately. What Wigu Publishing has created here are books that will last a lifetime, and work for generation after generation of children who want nothing more than to find their niche and discover their passion for the career they want to enjoy the rest of their lives. In this new offering, teaching is the focal point and, as we can all attest, teachers have one of the hardest jobs in the world. Teachers must be able to not only provide facts, figures and data in their classrooms, but they also provide wisdom that the child can take with them as they go out into the world. Everyone can speak fondly of at least one teacher who touched their lives significantly with their help and kindness during the ‘growing up’ years, which are the most difficult. Carlee is a young girl who definitely sees herself as a teacher. However, she runs up against a big worry when her own mother comes to her school in order to teach. Let’s face it, embarrassment!! The last thing a child wants is for their parent to be front and center when they’re meeting friends. Just think about it! If Mom is a bad teacher or, worse yet, gives out F’s, poor Carlee will be a social outcast before she even gets her feet wet and finds her niche. But Carlee has an unusual experience the first day. When she receives her textbooks she begins to think about all the wonderful things that are out there - the other careers she could strive to have. Geography is studied, politics and great leaders of the past, as well as inventors and writers. The choices are endless. But Carlee soon discovers not only the pride and respect she has in herself and her devotion to education, but also that her love of teaching was instilled in her soul by a very great Mom. This reviewer jumped right on board with this series because, literally, it is one of the most amazing, educational and well-written paths seen in a long time. The history, the pictures, everything is memorable; not to mention, this series is also a wonderful way to turn the computers and cell phones off and actually have real conversations again about how bright our kid’s futures truly are. Quill says: Perfection! It is thrilling that there will be more of these books coming, because they’re sure to have children dreaming big dreams once again! In his latest book, The Trickster’s Hat, New York Times Bestseller Nick Bantock strikes a delightful balance between grounded logic and whimsical flair as he guides the reader through lessons on how to open his or her creative flood gates. Mr. Bantock’s witty banter places his Trickster in the forefront as he steps the reader through a series of tasks using both painting and writing as his mediums. His Trickster’s mission is to awaken and release the artist’s creative being that resides deep within his or her core. Through an array of 49 challenges ranging in their complexities from simple to grandiose, if the reader reaches Lesson 49 and still has difficulty in connecting with his or her artist, perhaps there were too many distractions to dissuade focus along the reading journey. To take on the challenge of writing a book for many artistic mediums and to do so without a ‘this is how you have to do it’ structure throughout, is an art in and of itself. Mr. Bantock achieves superb artistic delivery in The Trickster’s Hat. Through his consistent use of simple language he provides a solid grounding for each concept with logic that is tailor-made for the mind of an artist. Mr. Bantock had a clear vision when he cast his net: enlist a range of artists and teach them how to discover their artistic abilities. It is abundantly clear that this author resurrected his own artist to write this book through the able assistance of his Trickster. The non-structured exercises translate to adept and authoritative guidance. Congratulations to Mr. Bantock for admirably delivering a balanced blend of solid information. It is a terrific resource for a broad spectrum of writers, painters and sketch artists. Quill says: Stop taking yourself so seriously as an artist. Enlist and rally your Trickster. He is there and ready to be awakened. ‘On the Road’ by Kerouac is still hailed this day as an extraordinary journey. Let’s just begin by saying, Mr. Kerouac would be extremely fond of this new novel; it is literally one of the most engaging, beautiful, gritty ‘journeys’ to have come out in a very long time. Philadelphia, Washington, D.C., New York, and Boston make up the scenic focus of this trip. But it’s not just the streets you walk down that will have readers feeling as if they are beside the main character, but also the descriptions that are so detailed at times that it feels as if the actual movements, hustle and bustle of the city - even the scents - are actually jumping off the pages. A suspenseful tale builds during the time of the American bicentennial. Hoagland is a man with a passion for both music and writing. Dealing with a realistic yet cold and chilling tale, he finds himself immersed in everything from poverty to unemployment to the power of true love that can elate and break the heart. Hoagland has many issues in life, but the fiercest come from the working world, where he finds himself tied-up in a vindictive realm where publishing houses and the ‘powers that be’ within the industry put him to the test. 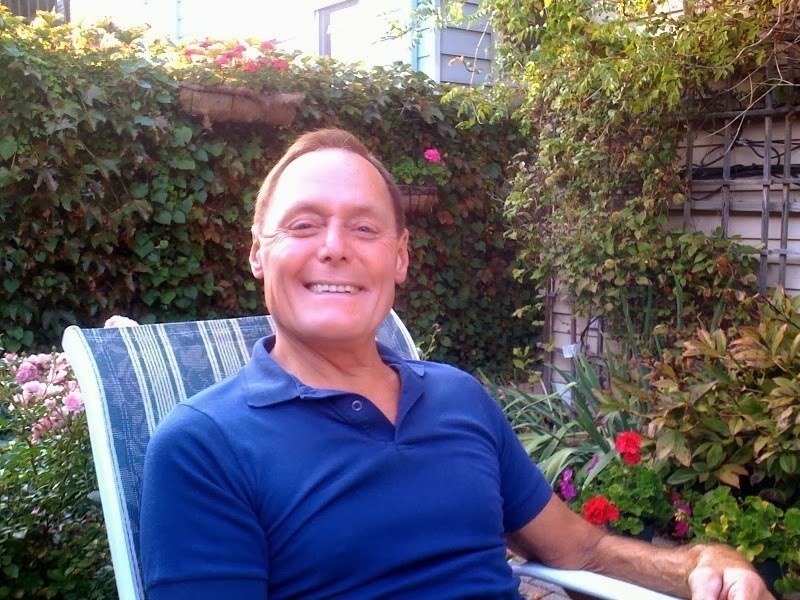 Hoagland is a hardworking man with a poetic soul, and he brings the reader with him as he strives to make it in an industry that is not exactly known for ‘brotherly love,’ unlike the city he dwells in. When it comes to the romantic side of life, Igla is the woman who comes to life within the pages. Her amazing character (almost mystical, in fact) brings words of wisdom, confusion, and sometimes pain to Hoagland’s world. With each new day - with each new step along the trek of suspense, Hoagland must face everything from street riots to the shades and realities of law enforcement, black history and more; even the subject of women, seen through the eyes of Hoagland, gives readers a banquet of characters from Igla to Andrea, who is a female that gave Hoagland more than his share of hard times. ‘Technicolor’ is a description that cannot be used in reviews a great deal, because there has to be a certain type of poetry and a constant flow of both plot and characters to warrant the adjective. 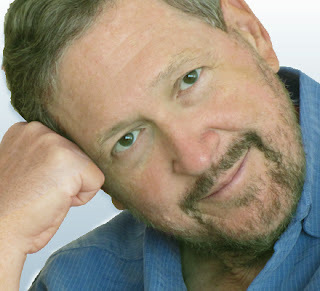 However, when it comes to this author’s take on what the souls of people carry with them as they walk the streets of cities across the country, readers will find themselves viewing everything they have come to love, respect…as well as repulse, such as the value of money versus the value of talent. Quill says: For a small book, this author has unleashed a rich, vivid tale that readers will remember long after the book has come to an end. What Can First-Time Authors Do to Get Their Books Noticed? When their first book appears, it may be natural for authors to imagine that the hard work is behind them. After all, they may have put months or even years of thought and effort into crafting that book. Surely—now that it is finally on the shelves and available for download—it is time to sit back and reap the rewards of their labors? Unfortunately, it is rarely as simple as that! If the first-time author is a celebrity, or if the subject is a celebrity, the famous name alone may be enough to have readers flocking to the bookstores to pick up a copy. However, the books of authors who are complete unknowns could easily languish undiscovered on the bookshelves and on the web, unread and unappreciated. The reason for this is easy to understand. Many books are published every day and if readers do not hear anything about your book, they are very unlikely to discover it for themselves. However brilliant or worthwhile a book may be, if readers do not know it exists, they will never be in a position to discover that for themselves. For the unknown first-time author, the really difficult work is just beginning when they publish their book. This is the time when they will need to direct their efforts into making sure that readers know that their book is out there. The first question the author needs to ask him or herself is: “Who is my ideal reader?” If their first answer is that their book is for absolutely everyone, they probably need to give the question more serious thought. Few, if any, books will appeal to everyone. While they may be loved and raved about by some readers, others will be completely unmoved by them. If they have a clear idea of the readers who will be interested in their book, this can give authors some valuable clues about how to reach out to those readers. There are many book review web sites and book blogs, so the author could set out by contacting those which are most likely to be of interest to his or her readers. The owners of the sites or blogs may be interested in reviewing the book or interviewing the author. They may even want the author to write a guest post. Another online resource which many authors, both new and well-established, use to reach out to their readers is social media. This may mean having a fan page on Facebook which readers can “like” or an account on Twitter for them to follow. It is worth remembering that there are also niche social networks, such as Goodreads, which is targeted specifically at readers. Another online method of drawing attention to a new book is by appearing as a guest on a podcast. There are many book-focused podcasts and they are often hungry for interesting author interviews. While their book risks being overlooked if they do not make an effort to promote it, many first-time authors feel that writing articles and blog posts cuts into time that they would prefer to spend on writing their next book. This is especially true if they are self-published and have a lot of control over when their next book becomes available. They have a good point, as having several books available is good as it increases the chances that readers will discover one of those books and decide to seek out the others. For this reason, authors may decide to outsource articles and blog posts to writers who specialize in providing high quality content for the web. These writers can produce relevant and interesting articles design both to appeal to readers and to be discovered easily by search engines. Authors who decide to hire content writers to take on this work should be careful to ensure the company or individual they engage has a reputation for producing articles to a high standard. There are some content providers who produce incoherent, ungrammatical or otherwise substandard work. Even if their work comes cheap, it could do more to damage the author’s reputation than enhance it! In the days before the Internet, authors promoted their books by stepping out of their homes and meeting their readers face to face. This is still one of the most impactful ways of getting a book noticed and sparking readers’ interest in finding out more about it. Depending on the nature of their books and the area in which they live, authors may find that much of this kind of promotion can be done in their home town or city. Offers to do a reading at a bookshop or reader’s group or, if it is a children’s book, in a local school could be met with open arms. Authors may even find themselves invited to speak to local writers’ circles about their experiences of writing and publishing their first book. The more people they convince to read their book, the more likely authors are to reap the rewards of the best kind of publicity of all: the personal recommendations of readers who loved their books and are excited to share their latest discovery with their friends and family. FQ: I’ve read many books about soldiers coming home from war, but found Along the Watchtower quite different and original. The use of a fantasy story to help with the healing process was very innovative. Would you tell our readers a little about how this idea came about? LITWACK: I’ve always been fascinated by how subjectively people perceive reality, each of us bringing our own experiences and biases into play. But when we’re ripped from our normal lives and placed in extreme circumstances, our reality becomes totally fragmented. Such is the case with hospitals and war. Then a couple of years ago, I become engrossed in the online fantasy game, World of Warcraft, playing with my son. I’m on the East Coast and he’s on the West, so we’d meet every Wednesday evening in the virtual world of Azeroth, where our avatars would go on quests together. I was struck by how quickly time passed and how immersed I became in the surreal mood of the game, wandering around in strange places, solving riddles and overcoming trials. The fantasy gaming experience has a dream-like quality to it. And I began to wonder: how would this experience affect the dreams of someone whose reality has been fragmented by war, PTSD and traumatic brain injury? These concepts—war, hospitals, and the fantasy world of online gaming—came together in Along the Watchtower. FQ: Your protagonist, Freddie Williams, is a big gamer. Do you share this passion with him? LITWACK: As the father of two sons, I played a number of games with them when they were younger, starting with the granddaddy of quest games, The Legend of Zelda. As part of my research for Along the Watchtower, I played a lot of World of Warcraft, like Freddie Williams, playing as a human warrior and a Dranei priest. I enjoyed playing these games, but they take a lot of time and detract from my busy writing schedule. I unfortunately topped out at level 63. Maybe someday . . .
FQ: Freddie suffered from PTSD, and the symptoms he suffers read very true. I’m thinking, for example, when Freddie saw the soda can and froze because in Iraq they were sometimes used to hide IEDs. How much research did you have to do to make the text so realistic? LITWACK: I did a lot of research. One of the best books I read was Achilles in Vietnam. Written by a PTSD therapist, it contrasts actual discussions from his sessions with Vietnam veterans with dialog from Homer’s Odyssey. In this way, he’s able to show the tragic effects of war on soldiers across the millennia. By the way the full title is: Achilles in Vietnam: Combat Trauma and the Undoing of Character. I also researched brain trauma. In an Instant is the story of Bob Woodruff, the CBS news correspondent who had just been named anchor when he was injured in an IED attack while embedded with troops in Iraq. It gave me insight, not only into the struggles to recover from brain injuries, but also how strange is the working of the human brain. At one point, the brilliant Woodruff could rattle off all past American presidents, but couldn’t recall the names of his own children. And I read and listened to many stories from veterans. Until Tuesday is the story of a young Lieutenant who had difficulty functioning after the war and was helped to recover when he got a service dog named Tuesday (As an aside, these dogs are incredible—they can sense when their master is having a nightmare and wake them up). The Blue Cascade is another heart wrenching story of an Iraq veteran who returned home bitter and disillusioned. He found a way to face what he’d experienced in the war by making a documentary film based on video he took during the initial invasion of Iraq. FQ: As I mentioned in my review, I found the gradual merging of the two stories a real plus. Was this something you set out to do from the start, as you began to develop the story? LITWACK: Yes, absolutely. One of the things I learned from my research is how difficult it is to return from a war and reintegrate into what we call normal life. For Freddie Williams, it’s especially hard, given his physical and emotional wounds as well as his tragic family background. I wanted to show his trials though his subconscious, since they were too painful to face in the real world. I decided early on that the best way to do this was to have Freddie, an inveterate gamer, invent a game-like fantasy world and confront his demons there. FQ: In respect to the fantasy aspect of the story, are you a big fantasy reader? If so, what authors are your favorites? Do you have a favorite fantasy sub-genre that you enjoy? LITWACK: I grew up on sci-fi and fantasy, reading Tolkien, Edgar Rice Burroughs, Isaac Asimov, Robert Heinlein and Arthur C. Clarke. More recently, I’ve read Robert Jordan’s Wheel of Time series and discovered Neil Gaiman. But I also love literary fiction. I read all of Steinbeck and Hemingway by the time I was seventeen. In a way, Along the Watchtower is a blend of the fantasy of the former and the harsh realism of the latter. FQ: I appreciated the mystery of the four trials that Prince Frederick had to solve. Was it a lot of fun to come up with such trials? LITWACK: I’m not sure fun is the word. When I write, I identify closely with my characters. The fantasy world was a terrifying place for Prince Frederick just as the real world was for Freddie. It did, however, give me a lot of freedom to get creative in how each of Freddie’s real world trials were reflected in the fantasy realm. FQ: Prince Frederick constantly wanted to use magic to help him out of his dilemmas, but he was repeatedly told, by various characters, that magic was not the way, that he needed to rely on himself. Is this a message for the real Freddie and his attempts to move forward, to heal? LITWACK: Much as the VA doctor tells Freddie that escaping reality is not the way back in his recovery, Prince Frederick is told that the solution to the trial is within himself and not through some outside magic. FQ: I found Prince Frederick’s search for the trials similar to Freddie’s search for his brother Richie. Was this deliberate? LITWACK: Prince Frederick’s attempt to confront the trials in his world certainly reflect the emotions Freddie was experiencing. I did try to give the fantasy world a dreamlike feel. And just like in our dreams, we can find similarities with real events, but they’re not an exact match. FQ: Your next project, The Daughter of the Sea and the Sky will be out soon. Would you tell our readers a little bit about the novel? LITWACK: My third novel, The Daughter of the Sea and the Sky, is very different. It’s about an alternate world divided between the Blessed Lands, a place of the spirit, and the Republic, whose people worship at the altar of reason. A mysterious nine-year-old girl from the Blessed Lands sails into the lives of a troubled couple in the Republic and seems to heal everyone she meets. She reveals nothing about herself, other than to say she’s the daughter of the sea and the sky. But she harbors a secret wound she herself cannot heal. It was recently accepted for publication by Evolved Publishing and is set to be released in May, 2014. 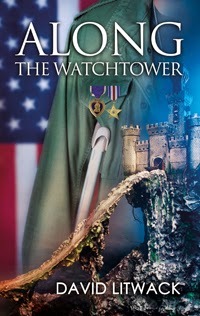 To learn more about Along the Watchtower, please read the review at: Feathered Quill Book Reviews. The daring, heroic, and dangerous story following Mason, Omar and Levi continues in this second book in The Safe Lands Series. In Outcasts the reader is reunited with the three brothers as they try to find a way to free the children of Glenrock from the boarding school, solve the mystery of liberation, and possibly find a cure for the thin plague. After the initial shock of being captured and the wonder of the new technologies of the Safe Lands, it is now becoming clear to all three brothers that this place is not safe at all and their only chance for survival is to find a way out. Each person knows it will take everything they have to get out of this prison and everyone has a job to get done. Mason is working to see if there is a cure while trying to learn information from Ciddah, the medic who Mason has been assigned to work under and has a slight attraction to as well. Omar battles with his own addictions while trying to be a better man for Shaylinn, and then Levi struggles with how to be a leader but not over controlling. Each problem they face is attached to an infinite number of obstacles that have to be conquered and conquering them will take more strength than any of them thought they had. Jill Williamson has a way of writing that leaves the reader wanting more after turning every page. Especially at the end of each chapter, she brilliantly leaves the reader with an agonizing cliff hanger that cannot be ignored and I found myself giving in and reading the next chapter almost every time. The end of the book also leaves with an epic cliff hanger and has me hoping that another installment is in the works to give some much needed answers. The relationships that are built with each character are complex as they are built on extremely strong emotions, both positive and negative. Those feelings are easily seen in the writing and allow the reader to truly feel what each character is experiencing for Williamson brings that to life beautifully. Before reading this second installment of The Safe Lands series I did read the first book, Captives and I am very glad that I did. This allowed me to know exactly where the people of Glenrock came from, why they lived outside of the Safe Lands and their brutal introduction to the life inside the wall. Without knowing all of those details it would have been difficult for me to realize why it was so imperative to escape and understand the level of loyalty these characters held for each other. In addition, there are many character relationships that are developed in the first book that continue into the second. With many books it is hard to understand why a certain relationship is where it is currently without knowing the reasons that caused those emotions. So, if this is a story that looks interesting to you I would recommend starting with the first book and then reading this one, for it will allow you to truly dive into the adventure and get swept up in this life changing rescue mission. Quill says: Outcasts is an absolutely breathtaking epic story that shows the bonds of love and loyalty when life is at stake. While Ella and her mom were in the sports store, she spotted a basket of brand new soccer balls. It would be awesome to have one, but when she asked her mom to buy one she said “That ball costs $20.00. We’ll talk about it tonight.” A new one would be so much better than her old one for sure. Later Ella’s mom gave her a $2.00 allowance to put in her three jars: Save, Share, and Spend. There was $1.00 in that Spend jar and she had a long way to go before she could buy a new soccer ball. Was there anything she could do to earn more money for that jar? Her friend Will earned his allowance, but Ella’s chores were “just part of being in [their] family.” She would have to do some “special jobs” to earn extra money. That car needed some cleaning. Into the trash bucket went all kinds of yucky things and Ella worked hard to vacuum it. There was one extra dollar! There were lots of houses in their neighborhood so Mom help her make some posters. “Hire Ella!” Mr. Hanson needed someone to weed and Ms. Lowry paid her “to give Barney a bath.” If you add in the $3.00 she made, how much more would Ella have to add to that Spend jar to get that soccer ball? This is an excellent book for young students to learn how to save money for the extras they want. While learning about saving, children will also have to learn about the importance of earning money. This simple beginning chapter book can be easily tackled by the newly independent reader. Small sidebars also prompt the reader to consider additional information about money basics. For example, one says “Amount in Ella’s Spend Jar $8.00 + $4.00 - $1.00 = $11.00.” In the back of the book is an index, a glossary, a “Make A Money Chart” activity, and additional recommended book and website resources to explore. There are additional complementary resources on the publisher’s website. Quill says: The Cloverleaf "Money Basics" series is an excellent way for young students to begin to learn about handling money. The dinos rush onward to the circus tent. No, not to see the clowns, but it’s off to the Dino-Wrestling Jamboree they go. They smile as they fly thought the air or tromp their way to the entrance. “Athletes travel many miles, / compete in different wrestling styles.” The banners are up as the dinos file in to fill the stands. Rah! Rah! Rah! Will they be treated to folkstyle, lucha libre, or Greco-Roman? Perhaps some sumo, freestyle, or even a pro tag team match. Allo and Ankylo are up first with a bit of folkstyle. The mat is circular, the ref makes sure they stand behind those two painted lines, and then the shrill sound of the whistle blows. The match is on! Allo rushes in to throw Anklyo, but no go. Anklyo swoops down to grab him behind the knees to “throw Allo off-balance.” It works! “The ref counts down and--Boom--it’s done. / It’s Ankylo’s match! He’s number one!” The ref holds up Anklo’s hand, but there’s a commotion overhead. Hey, it’s the Pterodactyl Twins and they aren’t supposed to be there. Security makes quick work of those two and tosses them out of the tent. The crowd is roaring around a ring as El Diablo and Victorious Verde get ready to rock the place. “Up next, bright-colored masks and tights! / It’s ‘lucha libre’--dress to fight!” Rah! Rah! Rah! Who’s going to win this dino wrestling match? Can you guess? This is yet another exciting Dino game, only this time it’s the Dino-Wrestling Jamboree. If anyone has ever met up with any of the Dino games in soccer, hockey, baseball, or football it didn’t take long to become a fan of each and every one of them. The action is fierce, the rhyming scheme perfect, and the artwork is dino-dynamic and exciting. Dino-Wrestling definitely doesn’t disappoint and is as much of a draw as any of the other ones. The “Allos,” represented in red lettering, are the Allosaurus (carnivores) dinosaurs and the “Aknklos,” represented in green, are the Ankylosaurus (herbivores) dinosaurs. In the front of the book there’s a rush to get into the Dino-Wrestling Jamboree entrance where we see banners of the various wrestling styles youngsters will learn about as the dinos tussle. As usual, Lisa Wheeler has come up with another perfect dino treat! Quill says: If you have a youngster who likes dynamic dinos and sports, this is one sizzling hot book in a fun series! FQ: It is clear to me that you devoted much heart and soul toward character development and depth. How difficult will it be to turn out the light and close the door on Promised Valley and begin a new project? FRITSCH: Your assumption about devoting “much heart and soul” in writing the four Promised Valley novels is absolutely correct. I published them in successive autumns from 2010 to 2013 (Promised Valley Rebellion in 2010, Promised Valley War in 2011, Promised Valley Conspiracy in 2012, and Promised Valley Peace in 2013). But even before I published Rebellion, I’d spent several years living with my characters night and day. I already miss them greatly. It’s as if a large group of friends—the "bad" guys as well as the "good" ones—suddenly went missing from my life. But it hasn’t been difficult to begin working on a new project. I'm apparently addicted to having characters in my mind and writing their stories. My new "friends" are getting as sassy and bold with me as Blue Sky, Rose Leaf, Wandering Star, and all the others in Promised Valley did. FQ: In our previous interview of Promised Valley Conspiracy, I asked if you had plans to develop Promised Valley for the 'big screen' to which you said you would. How are your plans coming along? FRITSCH: At the time of our previous interview I thought I might finish the four novels and immediately start writing screenplays for them, one film for each novel. After my partner and I, enticed by the first three seasons of the BBC’s Downton Abbey, viewed the entire Rome series on DVD, we began to wonder if one-season-per-novel television screenplays might better serve the complexity and many characters of the Promised Valley tale. Because we haven’t answered that question yet, I've started writing a stand-alone novel (more about that later). FQ: I cannot help but think you must have experienced many moments throughout writing the series where you dreamed about your characters. Which character resonated most with you in Promised Valley Peace and what actor (or actress) would you envision playing the role (and why)? FRITSCH: You're so right again. My Promised Valley characters showed up in my dreams almost every night. And they still do. Every time I view a film or television drama that draws me in, I imagine the actors playing roles in Promised Valley. Wouldn’t she (Reese Witherspoon, say) be wonderful, I ask my partner, as Rose Leaf? My protagonist/main character is clearly Blue Sky, but playing him will be as difficult as acting gets. Severely suffering from what we'd call PTSD, he goes into a strange trance and fights on, killing whoever needs to die next. Can I suggest three related characters and the people who should play them? The Jake Gyllenhaal of Brokeback Mountain as Wandering Star. He shamelessly manipulates Blue Sky and admits he needs him in the same breath. Susan Sarandon as his mother, Dancing Song. Despite having seen it all, she’s still in love with life, letting "joy itself," as she says when another character suddenly dies, "guide her feet in dance and her voice in song." Tom Cruise as his father, Lightning Spear. Maimed and vindictive at the pinnacle of his youth, he's now as cracked as his kingdom. FQ: Horses play a more prominent and significant role in Promised Valley Peace. Why wait until the final novel to portray this premise? FRITSCH: I wanted to show how the Promised Valley people gradually learned to use horses. Blue Sky’s grandparents acquired the first of them from the river people, as stronger but more wilful substitutes for oxen. Blue Sky, Rose Leaf, and Morning Sun secretly defy their parents and ride them. When the valley people face extinction, they use them for the heavy hauling they need to defend themselves in their upper valley. After two hill-boy refugees devise a way to ride horses in their hunts, riding them in battle becomes the obvious next step. Horses are to the Promised Valley people what nuclear weapons, guided missiles, and drone aircraft are to us. They'll win you every battle you fight—but only as long as your enemy doesn't have them. FQ: You pose an interesting concept to the reader in your analogies of how the people are guided by the "gods." What is your philosophy toward the "gods" guiding humans and your take on the notion of: "there are no coincidences in life"? FRITSCH: In this telling of the Job story, the supernatural deity or deities who supposedly rule the universe lose out to human reason. As Blue Sky insists, his grandparents didn't exchange most of what little they possessed for a river trader's unwanted animals, i.e. horses, because some gods in a faraway, unseen heaven had asked them to. They did it because they were the desperate victims of a foolish king. FQ: There are many complexities to the story as well as an abundance of key characters. How did you keep track of who was doing what during the writing process? FRITSCH: I lived with these characters and their stories night and day for years. I came to know them—and I continue to know them—as well as any actual humans I've ever met. I dutifully maintained lists of characters and scenes throughout the writing of all four novels, but I rarely had to consult them to answer who did or said what at some earlier point in the story. I almost always knew. The lists were useful to assure me I had everything right. FQ: You're quite descriptive toward the Promised Valley landscape and the diversities between the hills and valleys. Is there any particular real place you spent time to develop the lay of the land in your fictitious Promised Valley? FRITSCH: Even as a child, I knew I wanted to write a story about people peacefully occupying an exceptionally fertile river valley surrounded by mountains keeping out their enemies. Whenever I took auto trips with my family and friends through mountains and saw such a valley—always within the United States—I'd think it was the valley in my story. As I describe it in the Promised Valley series, though, it would have to be located in a temperate area in Eurasia or northern Africa. FQ: I want to thank you for the pleasure of reading Promised Valley Peace. I'm looking forward to your next adventure. Would you care to share what that may be? FRITSCH: And I thank you for the pleasure of reading your reviews of Promised Valley Conspiracy and Promised Valley Peace. I like to think of the novel I'm presently writing as fitting within a "Midwestern Gothic" genre, if there is such a thing. It's set in a mostly German-American farming community in northern Illinois in the middle of the Twentieth Century—the Forties, Fifties, and Sixties. After the Second World War a young boy's mother runs off with the lover she openly consorted with while the boy's teenage father was fighting and drinking his way across northern Africa and western Europe. The boy's father kills himself, leaving the boy in the care of his grandfather. The community suspects that man, however, of committing fraud and even murder on his way to ownership of the largest farm in the county. I best not say more! To learn more about Promised Valley Peace, please read the review at: Feathered Quill Book Reviews. Ever have one of those days when you just can’t pay attention? When your mind starts to wander? Poor Hair Brain Jane has those days ALL the time and today, when she’s enjoying a beautiful day on Hilton Head Island, is no different. Hair Brain Jane first appeared in Hair Brain Jane, a book published in 2012. The ‘brainchild’ (pun intended) of author/illustrator Andrea Studenc, Jane was created to help Studenc’s first grade students learn to pay attention. As an assistant teacher at a private school, she had worked with many students who had trouble staying focused. Her book, then, with a student who has thoughts literally pop out of her head as pictures, was her answer to explain to children how important, and hard, it is to concentrate on the topic at hand. 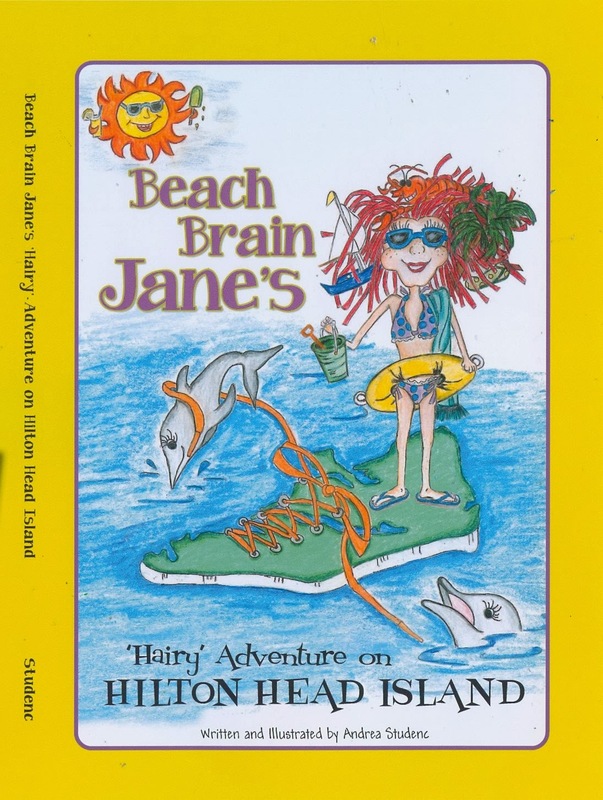 In her newest book, Hair Brain Jane takes the reader to Hilton Head Island for a day-long adventure. Part children’s story, part travel brochure for the popular tourist spot, the book tells of many of the island’s best places to shop, play, and eat. Chicken & French Fried ‘Tators! The story is fun and goofy, with all sorts of amusing visions popping out of Jane’s head, such as popcorn, ice cream, and a bird. The story mentions specific stores, restaurants, and other places by name so those not planning a trip, or not familiar with the area, may not get as much out of the story. However, if you live on Hilton Head, or plan to visit, this would be a fun book to introduce your children to the vacation spot. Quill says: If you’re traveling to Hilton Head Island, South Carolina, this might be a good book to pick up for your youngster to acquaint him/her with all the fun things to do on the resort island.